The Vancouver Real Estate market was blindsided with another demand side policy from the BC Government. Beginning November 30th strata corporations will be able to fine owners or residents up to $1,000 a day for defying the corporation’s bylaws on short-term rentals. The maximum fine was previously set at $200 per week, a small price to pay when renting your condo illegally on Airbnb. While the new law will be implemented across the province, this adds to recent regulations implemented by the municipal Government in the city of Vancouver. Current city bylaws state short-term rentals are only permitted in your primary residence with a business licence. Further, the strata must permit short term rentals, which the vast majority do not. While the immediate impact of these changes is unknown, we can certainly speculate this will discourage fringe buyers who might be contemplating purchasing a condo with the intent of becoming a full time Airbnb host. 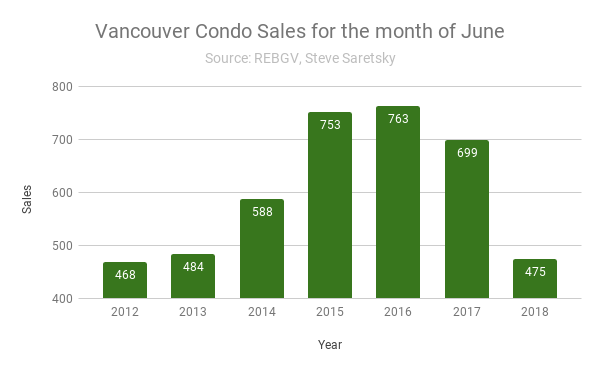 Demand has been dwindling in the Vancouver condo market as of late, with sales slipping to a five year low in the month of June. Will we see a few more listings hitting the market as sellers dump their Airbnb properties? Vancouver condo inventory levels already jumped 44% in June. If not I imagine this will encourage owners to place the home on the long term rental market. This would be welcoming news to a city suffering a sub 1% vacancy rate. However, recent data analysis from Louie Dinh suggests rent prices in the city of Vancouver have topped out, registering no growth in recent months.